This is a guest post from Chris Salvato. So, what if I said that you could achieve a handstand in a much shorter time period than you think? Would you tell me that is was impossible? That you couldn’t possibly do it? Might our conversation go like this? Luke: I can’t believe it! Once you start believing that you can perform your first handstand, its amazing how quickly progress comes. 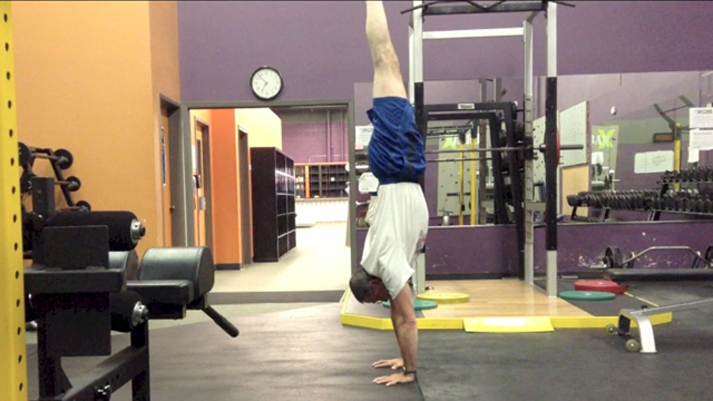 I routinely get beginners and intermediates to their first freestanding handstand within 60 days. That’s two months to reach a goal they once thought impossible. NOTE: Nerd Fitness now has an updated resource on how to finally get your first handstand. 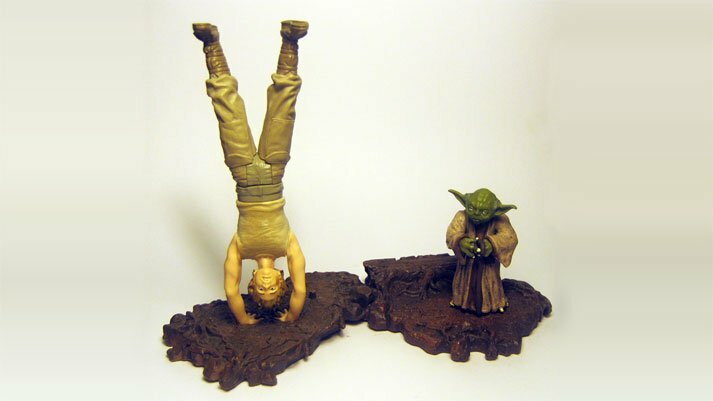 Most Padawans think that the handstand is a feat of strength. We can draw from Master Yoda’s wisdom again; our Jedi Master was more capable than even the biggest and strongest of the Sith Lords. The handstand does not require great strength or big muscles. You will need a base level of strength, however; you need to be able to hold yourself upside-down, with your weight supported fully on your hands and shoulders. Don’t worry, though! This level of strength is actually a lot easier to build than most people think, so long as you train the handstand frequently. Once you have your foundation in place, the handstand changes. It’s no longer strength training – it becomes skill training because you MUST train subtle movements and techniques that only improve through repetition. Skill training is usually not very taxing and your improvement is directly related to how much you train (unlike a feat of strength, which is usually very taxing and requires rest and recovery). Training handstands is actually more similar to learning to play the piano than it is to lifting weights or getting your first pull up. So, practicing handstands just once a week isn’t ideal. Even three times a week isn’t ideal. Because of the nature of skill training, practicing at least a little bit, every day (say, 5 minutes per day) will produce the best results. 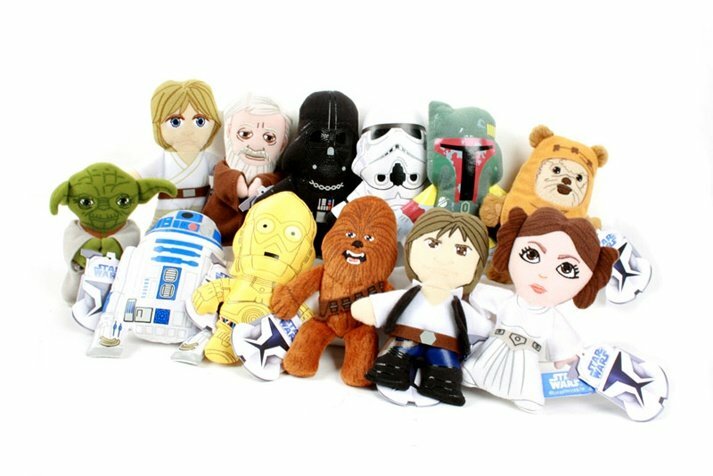 Luke was able to drop everything and fly to the Dagobah system to focus solely on his Jedi training….but you probably don’t have the time for that. You need to build a habit that slips right into your daily routine. 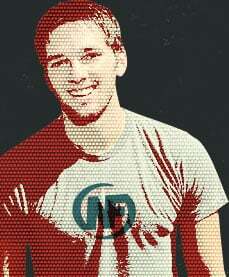 The first and most important step is consciously deciding that this is something that you really want. Write it down on a piece of paper: “I will do a freestanding 15-second handstand.” Slap that paper on your wall or on your fridge so that you can see it all the time…then freakin’ do it. Now that you have officially made this one of your goals, it’s time to kick start your commitment and challenge yourself. More specifically, challenge yourself to work on the handstand for 5-minutes every day, for 28 days. When you commit to doing something for 28 days, you build a habit — something that becomes part of your daily routine. But what exactly do you do every day? Once you have established a 5-minute habit, it effortlessly grows into a more frequent practice, which translates into faster learning. We all know of at least one young musician, who is inseparable from his instrument. It always starts with a small, consistent regimen and grows from there. Or make it a hard hat challenge: buy a calendar and red sharpie and get to work! When it comes to handstands, most instructors and tutorials sweep fear under the rug. 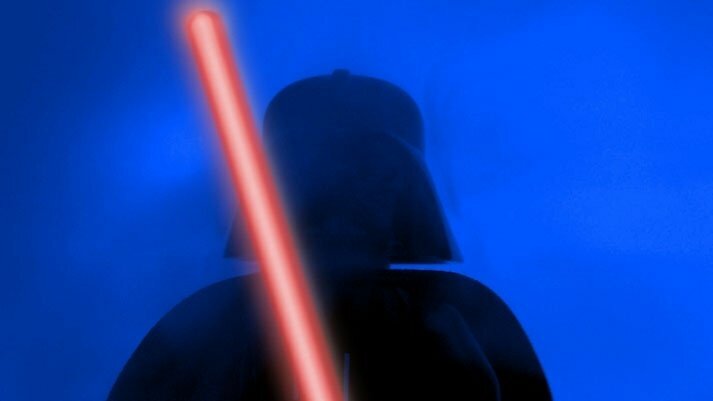 This is strange, considering over 90% of the people I have worked with have succumbed to the Dark Side of fear. 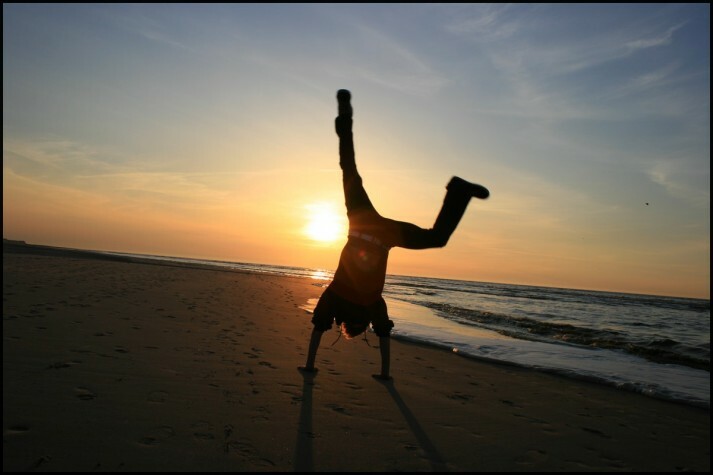 People avoid handstands because the fear of falling has held them back from handstand training…for years! Fear conquering needs to be built into your handstand training. Even if you get into consistent handstand practice, you still need to get over the fear of falling over yourself and ending up in a great big heap on the floor. Like every good Jedi, you need to learn to mitigate and eliminate your fears. You can’t ignore fear. 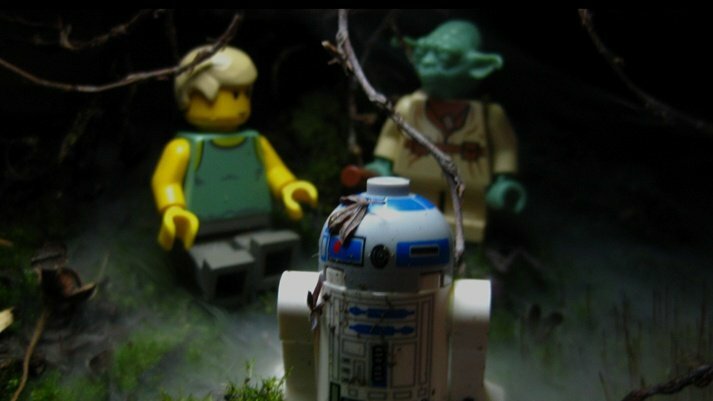 After all, Luke left Yoda before conquering his fears – before learning everything that needed to be learned. He left his training early…and where did that leave him? He lost a hand, and nearly fell to his doom! Don’t be reckless like Luke! Fear is the reason Luke almost died in Cloud City. Fear is the reason you haven’t tried to train the handstand before. Fear is the reason you won’t step away from this article and try kicking up into a handstand. If you want to perform a handstand, you need to acknowledge this fear and overcome it. The good news is that getting over fear is actually a lot simpler than you think. I have even helped a retiree with vertigo-induced nausea conquer the fear of falling over in less than two months, resulting in one of the best beginner’s handstands I have ever seen (Lyle is pictured above!). The key is to systematically and gradually introduce yourself to the handstand, to being upside down, and to relying on your hands to support you. To do this, you need to break the fear down into its simplest parts: fear of being upside down and fear of falling over. Without a solid strategy, many people let these fears hold them back for years without making progress. Afraid that your arms will give out? Don’t want to face plant? Or do you just panic when inverted?! You are suffering from a general fear of being upside down — but there is hope. This fear is what keeps most people away from the handstand all together. But that’s crazy! Overcoming this fear is simple and completely risk free if you follow a systematic fear-annihilating progression. Later, we’ll go through a progression that starts with normal planks on the floor. How can this be scary? Your hands and feet are firmly on the ground. Nothing too new. As you move forward in the progression, you put your feet on the wall, and walk your hands a little closer. Then a little closer. Then closer still. Eventually you will find yourself 12 inches from the wall and, *ta-da* you are holding a wall handstand with almost no risk of falling over. You are gradually loading your hands and shoulders with more of your bodyweight…so you get stronger and reduce fear! No Jedi Mind Tricks necessary. Sounds like a win/win to me! Scared to kick up and fall flat on your back? Think you will kick up too powerfully and slingshot your back right into the ground? Maybe you are scared of actually holding the handstand, then freaking out, losing control, and crashing, sprawled out, crying on the floor? But think, would this fear exist if you fell onto a fluffy mat? Or a soft pit of foam? What if there was no possibility of being in pain after falling over? What if there was literally no risk? The answer is simple: we need to remove the possibility of you falling over yourself. You need to learn to save yourself from a failed handstand. You need to learn to bail safely, without relying on the Force or good old-fashioned luck. Once you do that, the fear disappears completely. I know this sounds too good to be true. I know it sounds too simple. But it’s true, and it’s simple. I have seen hundreds of people conquer both of these fears in less than 28 days. You’re about to learn how. OK, so you are ready to start working on the handstand! You know you need to be committed, and conquer fear. So how do we get started?! If you have been working on the handstand in the past, then you have your head full of random tips and tidbits. You may be thinking about head position, body line, hollow body position, or a million other things. But you must unlearn what you have learned, young Padawan. The path to the handstand is remarkably simple, and it starts by forgetting all of those other tips and focusing on the small subset of skills and techniques that produce results. After rigorous testing, and thousands of students, there are only a few steps that you need to take to hit your first handstand. Start by going into a plank pose with your feet on the floor near the wall. Place your hands directly under your shoulders, and your feet firmly on the ground. If you can hold this for 60-seconds (5-8 long breaths), then move your hands a little closer to the wall by walking them backwards, and your feet up the wall. Bring your hands together, lock your elbows and push your shoulders towards the ground. Work on holding this position for 60-seconds. Repeat this over time, walking closer and closer with each attempt – even if it’s just one centimeter at a time. By approaching the first step in this way, you start in a safe position, and gradually increase your exposure to the fear while building strength. This constant exposure reduces the fear. Also, by starting with a simple posture, you start leveling up immediately. Every time you get closer and break new personal bests, you level up your “Handstand” ability even further. As you get closer to the wall, your plank starts to transform. As your hips get higher over your head, it turns into a wall handstand instead of a wall plank. You should never feel like you are at risk of falling over (if you do, walk your hands a little further from the wall until you feel safe again). The magic number is 12 inches – that’s the distance your hands should be from the wall. You can measure this by leaving a ruler on the ground just before you start to walk up. You don’t want to get closer than 12 inches at this stage, because then you risk falling over yourself before you’re ready – but any farther and you’d be in a plank. You should aim to hold this position for at least 60-seconds before moving on. But the best part of this challenge is that it’s very similar to the real handstand…and you won’t have any fear. How could you? It’s nearly impossible to fall over in this position. And, even better, this position prepares you to learn the bail, which is the most important part of the process. 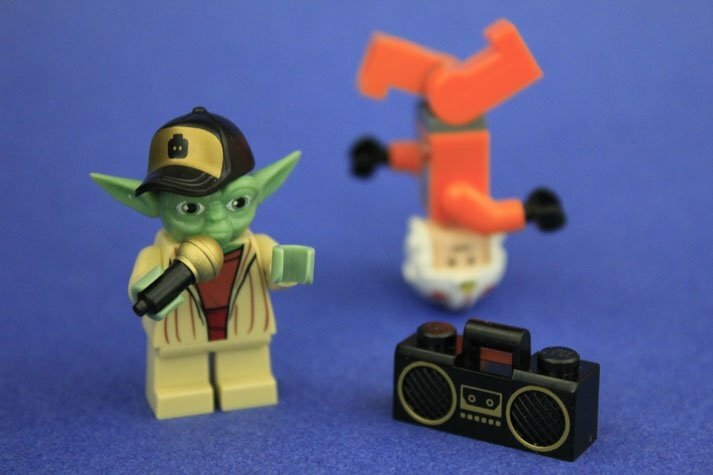 Since we don’t have the Force to keep us from falling over, we need to heed more advice from Yoda, and learn some freakin’ control! To gain control of your fear, you need to learn the best bailing technique around – the pirouette bail. The bail, like the handstand, is a skill. You can practice bailing frequently, without fear, since you can set up a safe environment to learn bailing against the wall. After in your best wall handstand, shift your weight to one arm (the planted arm), allowing the other arm to move. 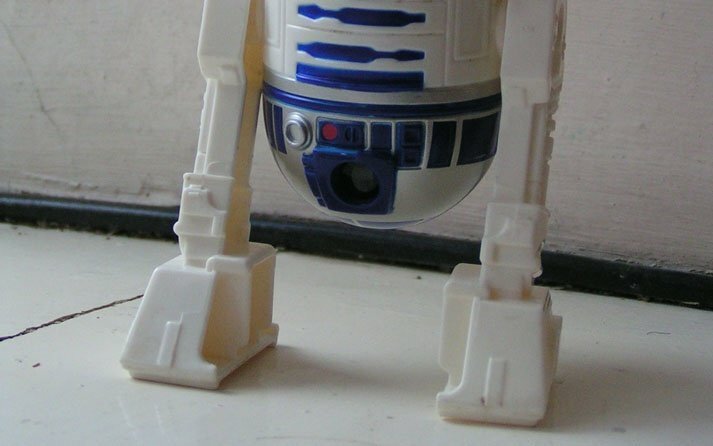 Finally, drive one leg into the wall (the one that’s on the same side as the planted arm), and lean the opposite leg forward. Gravity pulls you around, and lets you lower your feet to the floor safely. Looking for more? Check out more about the pirouette bail here. Learning this bail will help you take control of your fear of falling over. As you gain control, the negativity that flows through you will disappear. And you won’t even need to use the Force, like that cheater, Luke Skywalker. With bailing now a learned skill, you can start learning freestanding handstand balance. The easiest way to do this is to walk up into your best handstand, and then tap your feet away from the wall gently, trying to hold that balance as long as you can. When you have mastered near-the-wall balance, it’s time to start kicking up. Instead of walking up the wall (shown in level 2), you will kick up the opposite way, like a real handstand, by swinging one leg way over your head. You’re not jumping, but rather placing hands on the ground and swinging one leg REALLY high over you. Keep your arms straight and shoulders pushed towards your ears so that you don’t “crumple” to the ground. Kicking up near the wall will help you learn how much power you need to kick up properly, so your goal is to kick up without touching the wall (but it’s there to fall forward on, if you need it!). As you get better and better, you will start to find your balance; you will see that small adjustments to your grip and body position will have a massive effect. Eventually, you will build more confidence in your near-the-wall kickups than Han Solo has on the Kessel Run. That’s when you take all the lessons you learned, and move away from the wall completely. By the time you get to this stage, you can practice kicking up anywhere without any fear. Take that, fear! The elimination of fear will have completely liberated you. Then, it’s just a matter of practicing kick ups and freestanding balance as much as possible…but no less than 5-minutes a day, every day. But what if you kick up too hard? What if you start to fall head over heels? Well, then you just pirouette bail out to safety. If you get to this point, you won’t even feel this fear anymore. Sounds simple? That’s because it is. 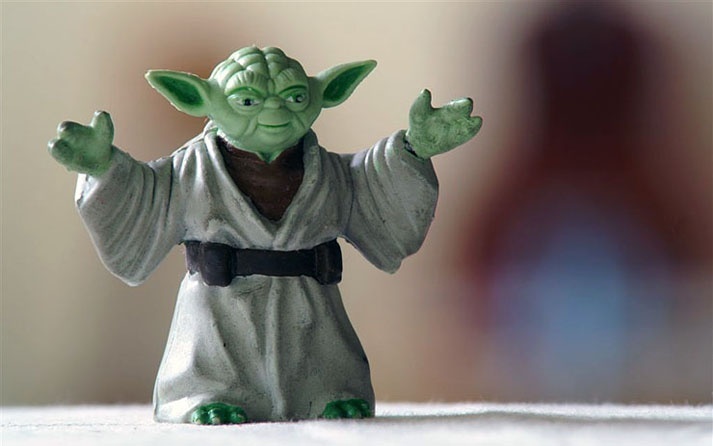 If you follow this system, you can likely start working on pirouette bails within a month – you’ll be conquering your fears faster than a Jedi Knight. Embrace handstands right now, while you are motivated and inspired. You have an empty wall in your house, office or gym (or, you can clear one out). Go to that empty wall now and do a quick 5-minute session of wall planks by walking up the wall and seeing how far you can get without fear. I’ll give you 5 minutes. Go do it. It’s just 5 minutes. Pretend it’s a bathroom break. Even if you can “only” do a standard plank on the floor, this is an AWESOME first step. Well, maybe not an agent of evil, but you will kick yourself…Now, take the 28-Day Handstand Challenge (free resources!) to keep the habit going. Follow the progression, and practice every day. You will make huge progress! Now just go out and train! Have you ever tried working on the handstand? What held you back in the past? Was it fear? What do you need to know to get started today?